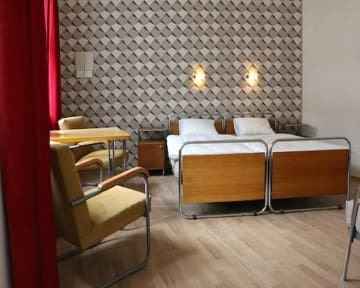 Hostel Boudnik, Praga, Czechy : Rezerwuj teraz! Prague’s district Zizkov is well known among the Praguers as the place to go if you want to have fun later in the afternoon. Zizkov has a reputation of a place with a lot of cheap and trendy pubs, bars and clubs with its unique atmosphere. By the foreigners it’s sometimes called Prague Montmartre. It was originally one of Prague’s working-class districts where it is not good to be after the sunset. Now it turned in to a place where all young people want to live or at least spend their spare time in a good company of their friends. There is literally pub on every corner and it is really the place where you can experience the real Czech pub and club atmosphere. Hostel Boudnik has small a bigger dorms, double or triple private rooms. We designed our rooms with inspiration of interesting Czech personalities and their life. Each room is unique. We know Prague well, we can help you to plan your trip. Each our guest will get very good map of Prague. Shared bathrooms, dining room, lounge, kitchens. Wifi is available in all parts. Nice courtyard, typical Zizkov balconies and nice view from our rooms. Parking is available 600 metres from us for 4 EUR per 24 hours. Our sister hostel is Hostel Lipa. Check in from 14:00. If guests check in earlier the we can keep luggage. Breakfast not included, it is available for 3 EUR. Tea and coffee is FREE. Smoking is not allowed in the building but you can smoke in the courtyard. Rewelacja! Fantastyczna obsługa, bardzo czysto, wystarczająca ilość toalet i prysznicy. 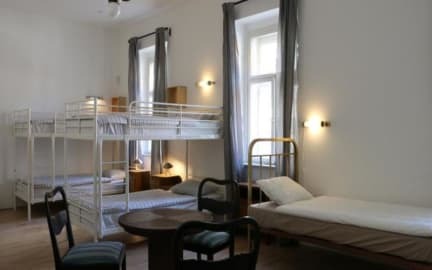 Za tą cenę to najlepszy Hostel w jakim byłem.